First Nerve: Traffic Report: How Fare the Fragrance Blogs? 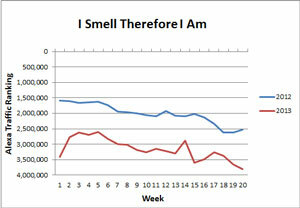 It’s been a while since I took the pulse of the smelly blogosphere using weekly Alexa traffic rankings. The Smelly Web Indexes™ used to be a regular feature here but fragrance blogs come and go at such a clip that it’s tough to maintain a consistent set of sites for tracking. Also, Alexa data are better for long-term trends than for weekly fever-charting. While in the wine cellar yesterday dusting off a bottle of the 1981 Château Lamothe Despujols Sauternes, I heard a piteous mewling from the data monkeys in the sub-basement. They hadn’t been fed recently so I tossed them a fresh bag of Doritos and grabbed the latest data on a thumb drive. 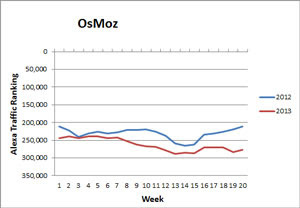 I decided to compare traffic rankings for the first 20 weeks of 2013 to the same period last year. Here is what I found. Three sites are doing better than last year; all are highly ranked: Perfume Posse, Bois de Jasmin, and The Non-Blonde. 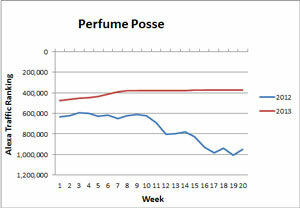 Perfume Posse is flying steady while the latter two seem to be in a seasonal fade. 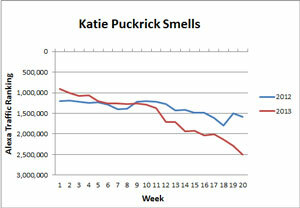 Three sites are more or less tracking last year’s performance: Perfume Smellin’ Things, Katie Puckrick Smells, and Firmenich’s OzMoz. 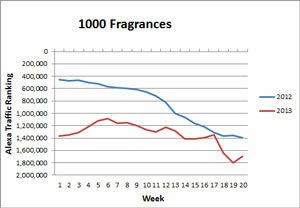 A fourth—1000 Fragrances—is relatively stable after big decline in 2012. 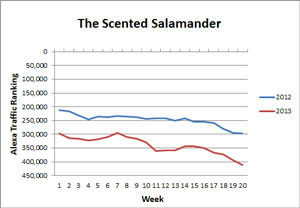 Five sites are consistently underperforming last year’s rankings: NST Perfume, Scented Salamander, Perfume Shrine, I Smell Therefore I Am, and Grain de Musc. 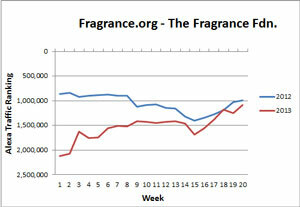 The first three are among the highest ranking fragrance blogs. 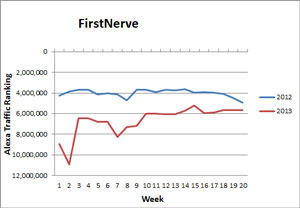 Two sites are slowing climbing back to where they were last year: FirstNerve and the Fragrance Foundation’s Fragrance.org. The Base Notes fragrance community site started the year at 2012 levels but is on a steady downward trend. Still, it remains one of the highest ranked sites in the smelly blogosphere. 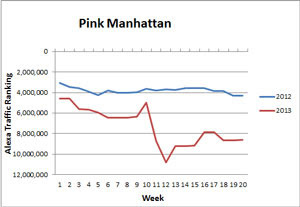 Four sites display abrupt downward deflections in traffic rank this year: Bonkers About Perfume, Mai Que Perfume, Pink Manhattan, and Indie Perfumes. The first three all lost altitude around the same time—namely, the week ending March 17, 2013. It should go without saying but I’ll say it anyway—I take no pleasure in observing traffic ranking declines. These are all high quality sites of long standing and I respect the blog owners, many of whom I have met. My interest is in finding out what the numbers might say about public enthusiasm for our topic and our individual ways of addressing it. I don’t have much in the way of interpretation. I wonder whether the demise of Google’s Feed Burner has anything to do with the trends. I’d like to hear your observations and theories. That was my initial thought. Plausible for Bois de Jasmin and Perfume Smellin' Things. But doesn't account for Steady Under-Performers or the Sudden Loss of Altitude group. Of course, it could be both: an end-of-winter-blahs seasonal effect on top of a long-term downward trend. So technically I'd have to run the entire year to year comparison and de-trend the long-term effects. Anyone up for a statistics seminar on time series analysis? 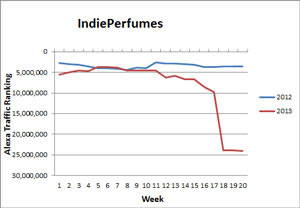 Stats are always interesting to me - also there seems like a ton of new and new-ish perfume blogs out and perhaps these new blogs are pulling traffic away from the ones that you mentioned? This has the potential to be a useful post, but it assumes that Alexa is accurate. Alexa is now being taken less and less seriously by people who track sites. Another important point is that almost all Blogger blogs have done worse on Alexa lately because of the way Blogger changed how it organises its blog pages, which of course had an effect on how these pages are indexed and tracked. I think a post like this should come with many qualifications and disclaimers, otherwise people will think it really reflects a lessening popularity of certain blogs. 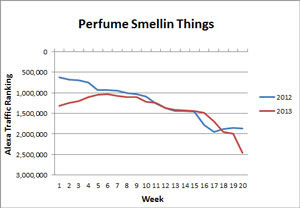 Some of these old guard blogs have also seen a decline in posting, in particular Perfume-Smellin' Things. 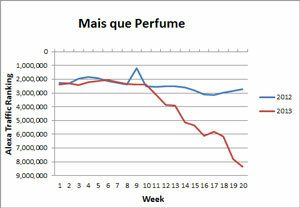 Perfume Posse was in a similar situation last year but successfully revived itself by recruiting some new writers. Anyway. Some fair points. In the past (see my posts on the Smelly Web Indexes) I've mentioned shortcomings in Alexa. 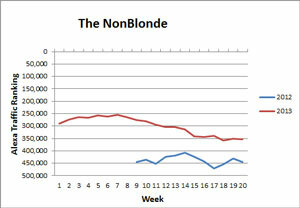 For example, they don't seem to update lower ranking blogs very frequently; the result is big swings all of a sudden. I wasn't aware of Blogger changes that affect Alexa indexing. I'll look into it. What traffic ranking would you suggest as an alternative? My issue in switching is that I have several years worth of Alexa; where would I get a comparable time series? Thanks for the observations. I suspect personnel and post-frequency changes explain some of the patterns. Yes, there have been changes on some of the older blogs you track. PST is now 1/3 food, about 1/3 re-run reviews from years ago, and about 1/3 new stuff, and they only have 3 writers now. Grain de Musc has not been very active, and is mostly about the author's interviews and industry events. Katie P. only posts about once a month now. Even Now Smell This has 3 days a week of "open thread"- from Friday afternoon to Monday afternoon, usually. 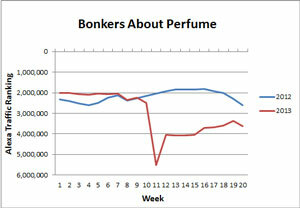 Some more active blogs to track are Olfactoria's Travels and Australian Perfume Junkies, they have been quite lively. Late to this post(! ), which I found fascinating, not least my own dip in traffic. In March I actually had several high traffic posts (in my own relative terms), one about a perfumista meet-up in London and two about Marks & Spencer's niche range created by Lyn Harris of Miller Harris. Now these would all have appealed mainly to British readers, so I am wondering if Alexa is more US-focused - I can well imagine a big dropping of of US readers at that point. I do detect a lull around the May mark, when I did a few posts on relatively minority interest subjects, say, then things picked up markedly in June when I did a stock take and giveaway and reports from a Paris trip. My stats are compiled by Google I think, in association with Blogger. I also use Statcounter, but those stats literally halved overnight when the country terminations were introduced - am I correct in thinking Statcounter doesn't pick up all the various endings that are country specific to readers? Anyway, Google is my best bet for the moment, which has me on 21-25,000 page views a month (excluding mine I believe! ), with about two thirds as unique visits. I accept that I am not actively chasing a big audience with reviews of particularly buzzy niche launches. I guess I plough a rather offbeat furrow in the blogosphere and don't suppose I'll change that now. Another factor which I think does affect a blog's popularity and traffic is the Wordpress vs Blogger angle. Wordpress is much easier to comment on, and Wordpress blogs quickly attract lively interactions, almost like people round a watercooler at work. ;-) I have actually had fellow bloggers come through to me back channel to say they find the captchas on Blogger too frustrating, which is why they don't comment on Blogger blogs - or very rarely. Thanks for your post. I'm just getting around to it. Sorry! A few thoughts: makes sense that your traffic goes up during giveaways, contests, etc. But it's sort of a sugar high, no? Traffic drops just as quickly when it's over. Not sure about Statcounter and country extensions. I use it and didn't find any blips. Alexa covers the globe--with sufficient traffic, they often show worldwide and US stats separately. Finally, I agree about Blogger's captchas being annoying. The design freedom and features of Wordpress are attractive, but frankly switching seems like such a chore . . .